Imagine a place on earth where it is possible to live in freedom and peace. Bussana Vecchia, located on the Italian Riviera close to Sanremo, is one of these very few spots on earth. 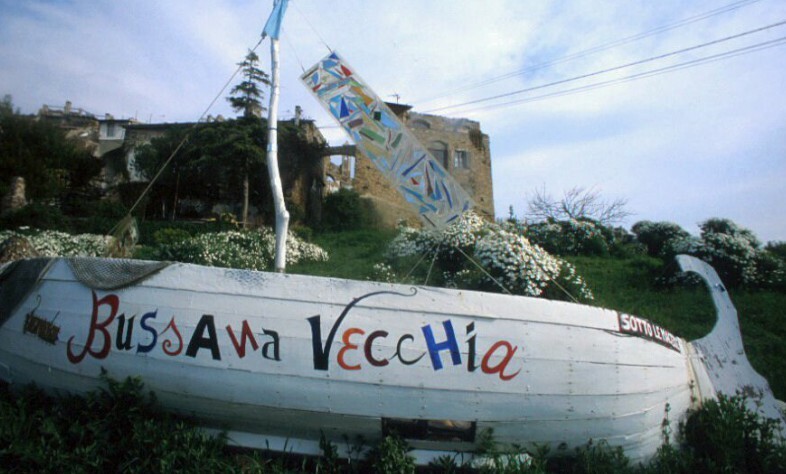 Bussana Vecchia has, since 1960, been a melting pot for artists from around the world. Painters, sculptors, photographers, ceramists, musicians, writers, poets and dancers have all helped to create this vibrant community and Bussana Vecchia continues to attract artists and art lovers today. Driving up the curved road towards the village and finding a parking place is one of the last things that reminds you on being in the 21st century. The feeling of being in another world starts when you walk in the direction of the entrance of Bussana Vecchia constantly looking at the skyline which is dominated by the belltower of the church that still stands straight after the earhquake of 1887. The first steps on the rocky streets gives you the feeling entering one of the last places on our planet that can be seen as paradise. Its atmosphere is peacefull, silence and lively, dynamic at the same time. It is a mix of walking in a medieval village and participating in an international art scene. Walking through Bussana Vecchia you see the remains of an old mountain village and also the artworks of the many artists living and working inside the village. You will also have the opportunity to participate in one of the activities like concerts, theatre or performances. Bussana Vecchia is living today in a medieval scenery. Around 1050 the count of Ventimiglia build on top of a rocky hill a castle, this was the beginning of Bussana. At the start of the 14th century the number of inhabitants expended substantial. The chapel became to small and a larger church was build. In 1652 a large part of this church was reconstructed. This church still dominates the skyline of Bussana. The interior of this church contains many fresco’s and artwork and was created by Comenedi, an artist from Liguria. February 23 1887 Bussana was struck by an earthquake. Substantial parts of the village were destroyed and many inhabitants were killed. Closer to the sea, 2 kilometers downhill a new town Bussana Nuova was constructed. The official start of the construction of Bussana Nuova was on June 14, 1889. Bussana was abandoned and became a ghost town. Clizia (an artist from Sicily) visited Bussana Vecchia and became inspired by its primitive beauty and the possibilities for an artistic society. In 1961 the Communit Internazional deli Artisti was founded. Many artists from Italy, France, Germany, England, The Netherlands visited Bussanan Vecchia and decided to stay. During the years Bussana Vecchia have been a source of inspiration for many. Still today it is full of creativity and remains a inspiring place for artists and visitors. Your personal exhibition in an art village could become reality. BussanArte can offer you the necessary support to organize such an event. Through out the year every day there are art lovers visiting Bussana Vecchia, but the most visited periods are around New Year, Easter and during the holiday season (mid june until late september). Because of it’s unique position Bussana Vecchia offers a wide variety of possibilities for projects. Finding new directions for a corporate strategy often needs out of the box thinking, Bussana Vecchia is the place to be. Other examples are summer courses, master classes, team building, product presentation, photo shoots. BussanArte offers an unique environment, interaction with artists, conference facilities, accommodations. We can combine these elements with your personal requirements into a tailor made program. This program makes it possible for individual artists to live and work in Bussana Vecchia and the interaction between the community and the visiting artists within this inspiring location can be a potent mixture. What we offer is a place to work, contacts with other artists, exhibition possibilities and help in finding housing. And of course the support to find your way around the Italian Riviera and the Italian way of living.A residency can be for any period of time but we recommend at least 3 months.Ideally a sponsor takes care of the costs involved. BussanArte is a not for profit foundation which organizes and supports art – related projects in Bussana Vecchia. Our primary intention is to realize multi – disciplinary projects combining diverse manifestations of contemporary art. These are selected from proposals which not only have an intrinsic artistic value but also contribute to the objectives of BussanArte. We aim to initiate and support two or three projects each year, the financing of which necessarily requires an element of sponsorship – a symbolic representation of art’s intrinsic relationship with the real world. Art is not a stand – alone phenomena but an essential expression of the world today, and when functioning harmoniously within the framework of modern society is of huge mutual benefit to all involved. If you think that Bussana Vechhia and the artist community a one-off donation of €50 euros or more makes you an official donator to BussanArte. You will receive a gift from us and we will keep you informed about upcoming activities at BussanArte and in and around Bussana Vechia. Or you could become a special friend. You will also receive a copy of “Testo&Imagine”, valued at €80,00. All this for a one-off payment of €500. Yes, I want to support Bussana Vecchia.